Currently exhibiting at The Pound 10th Annual Open. 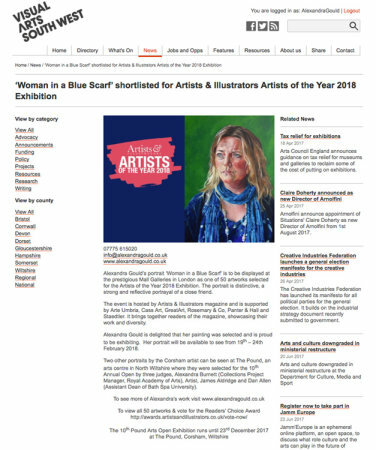 Alexandra Gould’s portrait ‘Woman in a Blue Scarf’ is to be displayed at the prestigious Mall Galleries in London as one of 50 artworks selected for the Artists of the Year 2018 Exhibition. The portrait is distinctive, a strong and reflective portrayal of a close friend. The event is hosted by Artists & Illustrators magazine and is supported by Arte Umbria, Cass Art, GreatArt, Rosemary & Co, Panter & Hall and Staedtler. It brings together readers of the magazine, showcasing their work and diversity. Alexandra Gould is delighted that her painting was selected and is proud to be exhibiting. Her portrait will be available to see from 19th – 24th February 2018. Two other portraits by the Corsham artist can be seen at The Pound, an arts centre in North Wiltshire where they were selected for the 10th Annual Open by three judges, Alexandra Burnett (Collections Project Manager, Royal Academy of Arts), Artist, James Aldridge and Dan Allen (Assistant Dean of Bath Spa University).